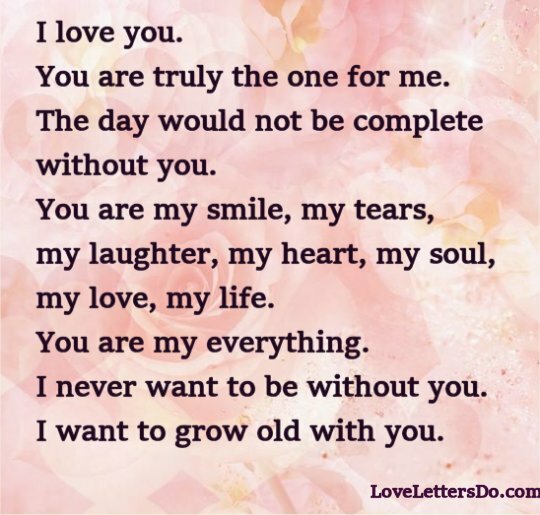 Beautiful I Love You letters that convey the deep feeling of love. No need to fumble for words, inspire yourself from these and be romantic ... nothing can replace a handwritten love letter. I love you. And not a day goes by that my heart doesn't tell you. But the silent words that whisper from my chest cannot be uttered in three little words (or 5,000 for that matter). Every time I try to describe the way I feel for you, the words seems trivial and hollow and in fact the whole English language seems insufficient. So now I am trying to write I love you, with the silent language of my soul as I pour myself out ... I hope you can sense these vibes as they might get into your heart and dance. Perhaps when you read this your heart will translate the language of my passion, a language of bliss that exists only because of you. Know that I am yours for as long as I live. You have no idea how much I love you. Nobody on this planet has any idea how much because very single love in this world is different and everyone loves differently. Never does the same love happen twice. Never will anyone love you the way I do ... I love you more than the sun, the moon, the stars, diamonds, money, possessions. There is nothing in all the world I want more than you. All those other people are nothing to me, all those materials things are also nothing. I love you with all my heart, my soul, my everything. I love you today, tomorrow, next month, next year, next life if there is a next life. I will always love you. I think I am the luckiest person to have known such feelings and I would never trade this for anything. When I first met you, I knew you were special. Something just clicked inside me, and there was a recognition that this was the beginning of something wonderful. You have made me see that life has so much to offer, that life is colorful and beautiful, not drearily dull as I used to see it. You and I are forever, I hope you know that. I want to share the rest of my life with you and I know you feel the same. Together we will decide the best way to do that, but I'm sure that our love will guide our path. We will travel life's journey together. I love you. Perhaps it has taken me too long to realize it, but you are truly the one for me. The day would not be complete without you. You are my smile, my tears, my laughter, my heart, my soul, my love, my life. I never want to be without you. I want to grow old with you by my side. The above letters were written by Gabor Timis, a romantic at heart, who also writes love messages from the heart and love poems from the heart.